I don't have an image for this one. I went to see Changeling on Tuesday the 11th. This movie tells the story of Christine Collins, a single mother living in Los Angeles in 1928 with her son Walter. Christine, who worked for the phone company as an operator, was called in to work on a Saturday. When she got home, her son Walter was missing. She looked in the area for him and then called the police, only to be told that they wouldn't do anything until Walter had been gone 24 hours. After five months, the police told Christine that her son had been found. When she was reunited with him, she knew the child wasn't Walter. The police wouldn't listen and then set out to discredit her and even went so far as to have her thrown into a mental hospital when all she wanted was to find her son. This is a very good movie. The subject isn't a fun one, but the movie was still very good. The fact that Walter vanished without a trace was upsetting enough, but what Christine was put through just because she was determined to find her son was awful. The police was so corrupt at the time that they could get away with anything and they certainly didn't want to admit to a mistake when Christine said that the boy they turned over to her wasn't Walter. The fact that all this happened at a time when women were still treated fairly badly in general probably didn't help matters either. The pace was a bit slow, but I was never bored by what was going on. Angelina Jolie was amazing as Christine. This movie deserves to be seen even though it deals with a very sad, upsetting story. I liked the first movie featuring Hellboy and I liked this one as well. This movie connected to the first one well while still having a different, unique plot. Certain things about the characters would make more sense if the movies were watched in order. I did think that some elements were liked things that Guillerno del Toro used in Pan's Labyrinth. The fantasy things worked well in Hellboy's world. The movie was very entertaining, with great special effects, interesting action scenes, and an interesting plot. There was some humor used here and there throughout the movie as well that I thought worked well. I know some didn't care for it, but I liked the scene when Hellboy got Abe to drink beer and they started singing along to a Barry Manilow song. People who liked the first movie should give this one a chance. I'm looking forward to seeing both of these! I think Clint Eastwood is the best American director these days and I love the style of his films. I hope you like them. They were both good, in different ways. Eastwood is a very talented director and there have been several from his movies that won Oscars. I still like animated movies and tend to see most of the new ones at least once. I haven't liked the ones from Dreamworks as much as the ones from Pixar overall, but I will still go see them. I have liked some of their newer movies, like this one, more than their earlier movies. I thought the movie was cute and entertaining. Po was a cute, likable character. Some things were a bit silly, but that didn't bother me at all. I thought the movie was very entertaining overall. The way the different styles of kung fu were represented by the animals worked well. I did think that the animation was well done. I think this was one of the better animated movies from Dreamworks. When young Alan Parrish discovers a mysterious board game, he doesn't realize its unimaginable powers, until he is magically transported before the eyes of his friend, Sarah, into the untamed jungles of JUMANJI! 26 years later he is freed from the game's spell by two unsuspecting children. Alan ('ROBIN WILLIAMS') reunites with Sarah ('BONNIE HUNT') and together with Judy ('KIRSTEN DUNST', 'Little Women') and Peter ('BRADLEY PIERCE') tries to outwit the game's powerful forces in this imaginative adventure that combines breathtaking special effects with an enchanting mixture of comedy, magic and thrills. I first saw Jumanji back when it was first released..I think I saw it in the theater. I hadn't seen the movie for a long time when I watched it again this time and I still really enjoyed the movie. The plot was interesting with having a game come to life and did provide for a fun adventure. The special effects do look a bit dated now, but I think they have held up well overall. Certain things about the movie were kind of silly, but I still enjoyed the movie. Robin Williams and Bonnie Hunt were really good in the parts. I thought the movie had a decent amount of humor. It is a good family friendly adventure movie that is worth watching. This movie picked up right after the end of Casino Royale, so it would be best if people saw that one before watching this one. I'm not going to say too much about the plot so I don't spoil anything for people who still want to see it. James had caught Mr. White and discovered a little bit more about the organization he was working for. He was still struggling to deal with everything that had happened with Vesper, but he kept working and was sent to Haiti. Once there, he met Camille and discovered that Dominic Greene, an environmental businessman, was also in the secret organization. Things got more complicated when Bond was suspected of some killings and M was having some doubts. Despite all that, James kept trying to learn more about Greene and the organization. He did discover that it was called Quantum. The movie was pretty good, though I don't think it is the best of the Bond movies. I know that some of the older ones got a little...silly at times, but I still really like the majority of them and find them to be very entertaining. I like them a bit more and while Daniel Craig is good in the part, he isn't my favorite. That would probably be Brosnan or Connery...though I liked Moore too. Anyway, I didn't mind some of the things that were different, but I didn't like some of the other things either. There was still no Q or Miss Moneypenny and it just seems weird for them to be missing. I like the little scenes where Bond and Moneypenny flirt and the scenes with Q would lighten the mood a bit. He had some really interesting gadgets in the past..those were basically missing in this movie. All he really had was a high tech cell phone. Some scenes were very violent..I'm not sure I like that the movies have gotten so much more violent...though the action scenes tend to keep things interesting. I hate the shaky camera work and quick cuts between shots. It was almost impossible to tell what was going on at times and things were passing in a blur, especially during a car chase that had the potential to be very impressive. In one fight scene, I couldn't tell who was James and who was the other guy even though they had different hair colors. I did really enjoy the movie overall and will probably add it to my DVD collection once it is out, but it isn't my favorite Bond movie. Some people who really liked the earlier movies might be disappointed by certain things. I'm seeing it tomorrow night. When it was first announced they'd used the Bourne stunt designer many said it looked like they would jump on the Bourne bandwagon instead of sticking what works best for Bond. I never thought they would, but word of mouth, comments about the action/violence and now your review seems to suggest they really have made it like Bourne. I loved the Bourne films, but I don't want to see identikit movies, especially with a franchise that proved itself and re-wrote the rule book multiple times. I know some of them were silly, but they were always a Bond for the times. From Russia With Love and Live and Let Die are my favourites and are marvellous. It was more like a Bourne movie than a Bond movie which is unfortunate really. Bond is a very different type of character in very different situations. His movies should be different instead of jumping on the bandwagon of the freaky shaky camera during action scenes and trying to out do Bourne. I've seen some ads on television claiming that this is the best Bond movie ever, but I don't feel that way at all. I'm not sure which is my favorite Bond..maybe Goldfinger or From Russia With Love. I got all the movies now and I've been watching them in order - I got away from that while watching scary movies in October, so I need to get back to that. I'm up to On Her Majesty's Secret Service. Anyway, there were a few things that did connect back to the older Bond movies. There was a very obvious reference to Goldfinger for anyone who has seen that movie. The secret group Quantum seemed to be a bit like SPECTRE even though the main villain show really wasn't that impressive as a villain. I really liked the Bourne movies overall too. I wasn't happy with what happened with Marie - though I will admit that I was genuinely shocked when it happened. I also hate the shaky camera work. Call me crazy, but I kind of like to see what is going on and who is who when I go see a movie. I did like Quantum of Solace overall..I just think it could have been better. I hope you like it when you see it. I said a lot in the review I posted on Epinions..like I tend to do. I've been posting movie reviews there since 2001. 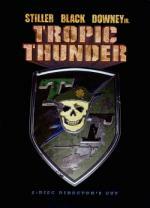 Go deeper into Tropic Thunder with this extended version of the hit film, packed with more action, more comedy, and more madness than ever before. When three of Hollywood's biggest stars head into the jungles of Vietnam to shoot a war movie, they have no idea how real things can get. Starring Ben Stiller, Jack Black and Robert Downey Jr., Tropic Thunder is the most unexpected and controversial movie of the year. First of all, I will say this is not a movie for everyone and some things will upset a lot of people. I thought it was very funny, but it was a twisted sort of humor that some people just don't like. That being said, I loved it. But I do tend to like movies that are a bit twisted at times. Ben Stiller, Jack Black, and especially Robert Downey Jr. were great in their parts. Downey Jr. somehow managed to make his character work instead of just being a giant mess. He was playing this sort of pretentious Australian actor who had won a bunch of Oscars who would always go to great lengths to get into his character. Since there was a movie being made within the movie, the main cast, especially Stiller and Downey Jr. were really playing two different characters and they all managed to make that work and seem believable. There were some good action scenes throughout the movie, including several impressive explosions. The violence did get a bit graphic at times, but it was done in such an over the top fake way that was it wasn't really gross and was more funny. Of course that might just be because I'm twisted.. There were a few other minor characters that were really funny too. I did listen to one of the commentaries on the DVD and it was really entertaining. I listened to the one with Black, Stiller, and Downey Jr. and it was very funny at times. I think it is well worth listening to for anyone who liked the movie. At one point in the movie, Downey Jr.'s character Kirk was staying in character even though things were going straight to hell. Kirk then said that he didn't break character until he did the DVD commentary. On the Commentary, Downey Jr. was talking like that character from the movie for almost the entire time. Very late in the movie when Kirk finally started to act like himself, then Downey Jr. talked like Kirk - with the Australian accent - for a while before finally using his own voice at the very end. It was so funny and tied into that joke in the movie perfectly. Downey Jr. was amazing in the part - or parts I guess you could say - and this did help to show just how talented he is. The other extras on the DVD were really good too. I have the 2 disc Director's Cut version that did add a few extra minutes here and there throughout the movie. There were a few deleted or extended scenes. The best extra was probably the one that was meant to be a making of documentary on the movie within the movie. It was so funny and showed how the director Damien - played by Steve Coogan - was loosing control over the movie and really started to flip out. It also showed more of the extremes Kirk was going to to play his character. One of Alfred Hitchcock's greatest cinematic achievements, 'Vertigo', celebrates its 50th anniversary with an all-new 2-disc Special Edition DVD! Set in San Francisco, 'Vertigo' creates a dizzying web of mistaken identity, passion and murder after an acrophobic detective (James Stewart) rescues a mysterious blonde (Kim Novak) from the bay. Recognized for excellence in 'AFI's 100 Years... 100 Movies', this dreamlike thriller from the Master of Suspense is as entertaining today as it was 50 years ago. 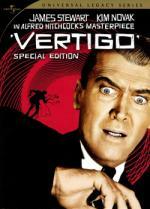 Featuring revealing bonus features and a digitally remastered picture, 'Vertigo' is a "great motion picture that demands multiple viewings" ('Leonard Maltin's Classic Movie Guide'). I did enjoy this movie, though not really as much as I have some other Hitchcock movies. The story was interesting and I wasn't bored with what was going on, but the movie did have a slower pace that might bother some people. It is a suspenseful psychological thriller that was dealing with obsession and how that can take over a person's life. I think this was the first time that I had seen the entire movie. Jimmy Stewart was very good in the part of John - or Scottie as some of his friends called him. John was a very different type of part than the others I've seen Stewart play. He wasn't really a bad guy, but he made some bad decisions. The movie is very good and worth seeing at least once, especially for fans of Hitchcock. Neal Page is an advertising executive who just wants to fly home to Chicago to spend Thanksgiving with his family. But all Neal Page gets is misery. Misery named Del Griffith – a loud mouthed, but nevertheless lovable, salesman who leads Neal on a cross-country, wild goose chase that keeps Neal from tasting his turkey. Steve Martin (Neal) and John Candy (Del) are absolutely wonderful as two guys with a knack for making the worst of a bad situation. It it’s painful, funny, or just plain crazy, it happens to Neal and Del in “Planes, Trains And Automobiles.” Every traveler’s nightmare in a comedy-come-true. This movie is hilarious, especially what happens with the rental car later in the movie. How that thing was still running I don't know. The movie is one of the few I have seen that is set near Thanksgiving and the while the holiday wasn't the main focus of the movie, it was important to the plot since Neil was trying so hard to get home in time for dinner with his family. Many people tend to travel around the holiday, so that aspect of the movie was believable and realistic. It was even realistic that Neil and Del would end up in a different city and having to resort to other forms of travel to make it to Chicago. Martin and Candy worked very well together and added a lot of humor. Neil was clearly annoyed with Del from the start, but he managed to keep that under control for the most part. He was finally pushed over the edge after an incident when he tried to rent a car and he did flip out, using a version of the word that rhymes with luck about 20 times in 2 minutes. That was a Clark Griswald type of flip out and it was hilarious, including the way he was using that particular word. Some aspects of the movie were a bit silly, but it was very entertaining overall. That's interesting because I do think Vertigo catches people out. It isn't quite a typical Hitchcock movie. I wasn't fond of it when I first saw it and I think I heard it was a bit of a flop on first release. Maybe if you watch it again... and again... and again... you might feel the same as me that it is not only one Hitchcock's best films, but also one of the truly greatest films ever made. It's like Citizen Kane; it takes a view runs to work its magic. Also like Kane, it is a hard movie to like at first because the character is so flawed as you say. I don't know, but somehow he makes more sense to me now than many of his other characters. I last saw Vertigo at a local cinema showing and it was just marvellous seeing it at a proper size. I have read that it didn't do that well when it was originally released. The rather..bleak ending probably contributed to why some didn't like it either. I didn't have a problem with that and thought the way it was shown did leave a few possibilities open. I do like the movie and think it is a very good suspenseful movie. Certain things with the character do make sense and the obsession he developed did make him more believable I think. Prepare to save the universe with the King of the Impossible! Alex Raymond's famous comic strip blasts to life in the timeless sci-fi cult adventure 'Flash Gordon'! When energy waves pull the moon out of orbit, New York Jets quarterback Flash Gordon unwittingly finds himself heading for the planet Mongo, where - with assistance from beautiful Dale Arden - he'll take on Ming the Merciless and rescue humankind. This must-own 'Saviour of the Universe' Edition features a digitally remastered picture, 5.1 surround sound, and the unforgettable musical score by Queen. Bursting with spectacular thrills and colorful dialogue, this Special Edition DVD features never-before-seen bonus materials. 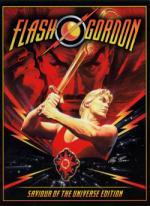 'Flash Gordon': He's a miracle! I decided to go ahead and use this one for my L entry. I had something else in mind, but I don't think I'll get to it in time, so I went with this one. There is just something about this movie that I really enjoy. It is cheesy as hell, but I like it. There was a lot of overacting going on at times, but it somehow seemed to work pretty well with what was going on. The plot was fairly simple and there really weren't any surprises. That didn't stop the movie from being entertaining. Ming the Merciless made a very good villain. This isn't a movie that will appeal to everyone. It is just a fun, entertaining movie. It also has great music.